Arc de Triomf is a Rodalies de Catalunya and Barcelona Metro interchange complex. It is named after the adjacent triumphal arch of the same name near which it is situated, in the Barcelona district of Eixample in Catalonia, Spain. The Rodalies station is served by Barcelona commuter rail service lines R1, R3, R4 and R7, as well as Girona commuter rail service line RG1 and regional line R12. The Barcelona Metro station is served by TMB-operated line L1. The complex is located near Estació del Nord, Barcelona's main bus station. 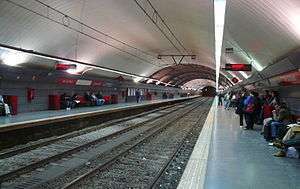 Rodalies de Catalunya railway station is located under Avinguda Vilanova between Passeig de San Joan and Nàpols street. 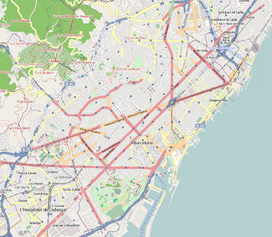 It was opened in 1933 as a prolongation to the city center on Puigcerdà and Manresa lines which had its terminus station in Estació del Nord, situated near the current railway station. It has two groups of accesses, one in Passeig de Sant Joan and the other one in Nàpols street. The accesses to the platforms are equipped with fixed stairs and both go to the same hall, where there are ticket vending machines. The station is being remodeled to make it more accessible for disabled persons. 1 2 "Listado de líneas y estaciones" [List of railway lines and stations] (PDF) (in Spanish). Ministry of Public Works and Transport, Government of Spain. Retrieved 27 June 2014.